Perhaps equally as unsurprising as the fact that people are using social media to exchange stories, is that they are also using them for play. Once again, however, what is interesting is the way that using media originally designed for everyday communications can reshape the process of creating games. Many amateur game developers are drawn to creating games this way, as it allows them to work with familiar and freely available tools. Yet, some of these games attract enough players to make even professional developers envious. For example, the statistics on the right were pulled from different language versions of the online game Travian. 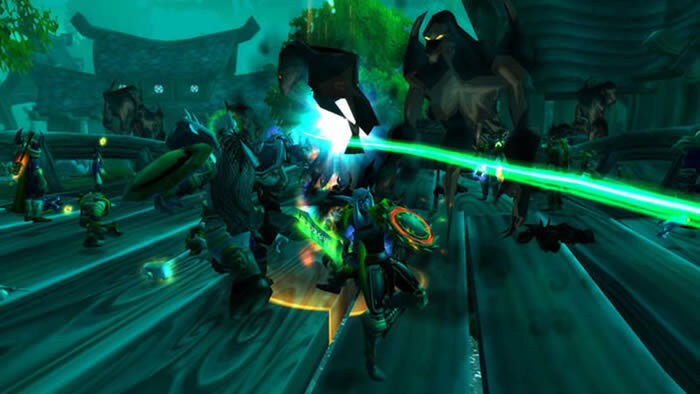 With about a half million players registered internationally, Travian's popularity approaches the current (2006) number one selling traditional online video game, World of Warcraft. Yet, whereas World of Warcraft enjoyed a development budget of 60 million dollars over 5 years, Travian was programmed entirely by Gerhard Mueller -- a 22 year old chemical engineering student in Germany. To be fair, Travian also relies upon a network of volunteer moderators to help manage the extensive communities it spawns, and attracts more players by being free (for the standard edition). Still, Travian clearly is able to offer a compelling game experience for a number of people on an extraordinarily low development budget (Note: this is not to say designing a game like Travian could be done by anybody. The designer must have an extremely strong understanding of modern video games and online social dynamics. Nor could one simply combine one game designer with one traditional educator and expect the two to be able to design a game that achieves both goals). A quick comparison of the two games shows that, in some ways (i.e. graphics), Travian is clearly deficient to World of Warcraft. However, both games feature unprecedentedly complex social collaboration. As social collaboration is increasingly becoming the primary force driving online video games, Travian manages to hold its own in the video game world. The image above shows a battle for a key city, in which 814 separate armies have coordinated a large attack. The defending team has coordinated over a quarter million troops (after playing daily for a few months, a normal player may have 3,000 troops) to help defend the city -- with over 384 re-enforcement armies on their way. Simply to prevent the defending army from starving, the team needs to coordinate to have numerous players sending food to the city hourly (often requiring coordination across time zones). The vast majority of the time spent playing Travian is used either posting messages in public diplomacy forums, coordinating strategies among team members in internal alliance discussion forums or writing negotiation emails to other players. Early in the game, my team was attacked by alliances from Hong Kong and Poland. To respond, we needed to collaborate with players from around the world to best defend ourselves. Most of the players we were corresponding with did not speak English as a first language, yet worked hard to be able to communicate with us with what English they knew or could learn from players willing to help. Others, simply refused to work with people that did not speak their native language -- putting those players willing to try using multiple languages at a distinct advantage. Routinely, players write commentaries about real world political negotiations -- either to draw lessons from in planning their own negotiations, or to critique based on their experiences conducting in-game negotiations. Clearly the fun in Travian (and similarly World of Warcraft) does not come from any rapid visceral adrenaline rush; often successful negotiations require days of composing carefully written diplomatic solicitations. Rather, as any player of these games will tell you, human beings derive pleasure in successful teamwork. When people work together (social) to solve problems (play) we get an additional pleasure of being able to solve problems so complex that we could never experience solving such a complex problem as an individual. Consider the Alternate Reality Game I Love Bees. In 5 days, network throttling will erode. In 19 days this medium will metastasize. At the end was an appeal from Dana, Margaret's niece, asking visitors to help her figure out what was wrong with the website. Many of the recipients then posted notes on their websites asking others to help them trace down the cause of the hacks to Dana's website. As their friends looked over the website, some noticed the images were scrambled in systematic ways which ultimately held encoded messages within them. Rather than answers, however, those messages contained even more perplexing messages bringing viewers even deeper into the game world of I Love Bee's and requiring them to bring in even more friends to help. Ultimately, I Love Bee's swelled to include over 600,000 players world wide, comprising one of the largest pools of collective intelligence assembled for history's most challenging scavenger hunt. Throughout the course of the game, clues would lead players to a series of GPS coordinates and time codes. Each of the GPS coordinates would correspond to one of a series of 40,000 payphones scattered across all 50 U.S. states and 8 countries which would ring at the specified time. By intelligently networking between the 600,000 players and effectively using technologies such as SMS, players were able to identify and relay instructions to players nearby key payphones scattered across vast geographic distances, within 20 seconds of notification. At the payphones, players would receive 15 second fragments of a 6 hour radio drama they then reconstructed on the web. All players of the game experienced a unique thrill of solving problems more complex than any of them would have ever experienced solving by themselves. Most importantly, though, the levels of teamwork required for the massively social tasks presented in ILoveBees provided one of the most fertile grounds for peer learning possible.